Brassy Christmas – Welcome to Bilingual Junior High School! About 30 pupils and their family members attended an outstanding concert at the Skyline, Wr. Neustadt on 18th December. Music by the Beatles, Irving Berlin and many more were performed by a brass quintet, lead by the director of the local music school, Mag. 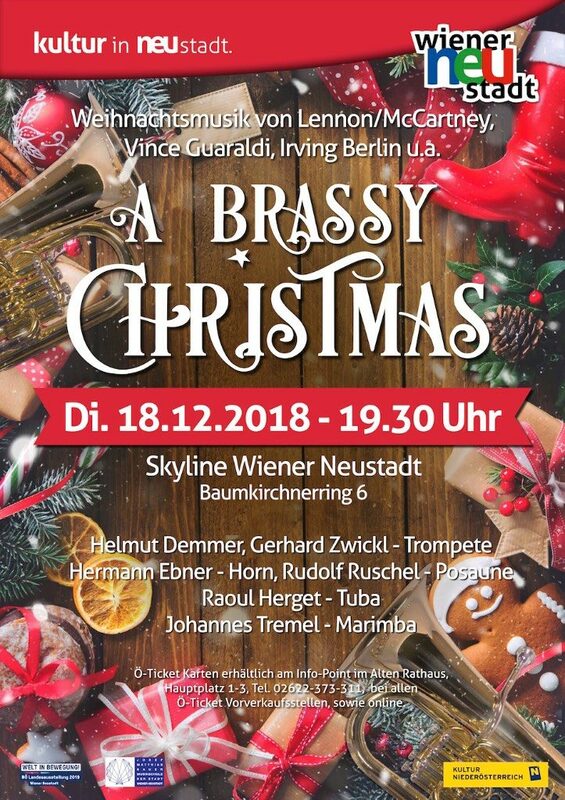 Raoul Herget, on the tuba and excellent players from the NÖ Tonkünstler and Theater an der Wien on the trombone, French horn and 2 trumpets. In addition we could listen to an instrument rarely played in live performances, the marimba. The City of Wiener Neustadt has recently purchased this wonderful instrument for the music school and its teacher Johannes Tremel. Our pupils not only had the opportunity to listen to professional players on their beautiful sounding instruments – ones that we usually only get to talk about in our music lessons – but they also received high quality concert tickets for free (thanks to the Kultur Marketing Abteilung WN, Mag. A. Potzmann & Mag. R. Herget), thus experiencing culture, being dressed up nicely and spending quality time with classmates and family members.